From Sonoita we headed up Hwy 83 to Gardner Canyon Rd and then angled over toward Gunsight Pass. Jim led part of this leg at a speed that I will have to labeled as 'Jim Speed'. At one point I was so far behind the other three that I could only catch an occasional glimpse of Troy's green jersey in the distance. I was going as fast as I dared. Jim's bike was alternating between running fine and only running at higher RPMs. Maybe he was trying to be sure his bike didn't die. As we closed on Gunsight Pass, Troy took the lead again because Jim was unfamiliar with the trail. The pace became much more comfortable. The trail to Gunsight has loosened up since the last time I took it. At one point the trail drops down a steep loose slope and there is a harder-than-90-degree turn that must be made while still descending. 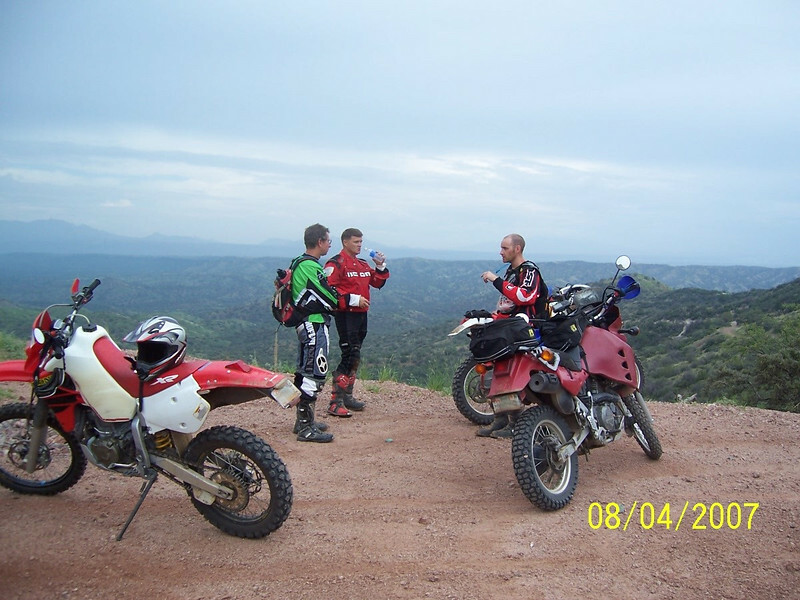 Craig and Troy laughed at Jim and I as we skidded down the slope on our dual-sport tires to make the turn. Jim's rear Metzler was the most street oriented tire on the trip.